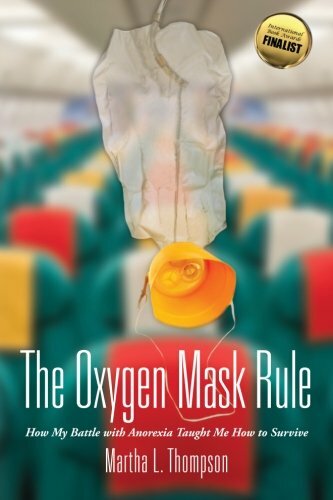 "The Oxygen Mask Rule" is a memoir that reveals how Martha Thompson, whose identity is shredded by the disease of anorexia nervosa, enigmatically lives a life full of adventure, accomplishments and spiritual growth. Although the book speaks in depth of anorexia and bulimia, it also recounts many humorous, dramatic and unique journeys over a thirty-five year period. Thompson was in and out of hospitals numerous times by the age of 14. Remarkably the disease did not claim her life in early adulthood and she was temporarily able to find an outlet for her emotional needs by getting involved in acting. She studied theatre at Marymount Manhattan College and the Juilliard School of Drama, both of which she attended on full scholarship for her talents. However, the summer before her freshman year of college, she traveled to Turkey where she fell in love with a Turkish man and was set to marry him. The objection of him marrying an American girl by his parents led Thompson into a downward spiral of depression, which became another catalyst for her eating disorder. To rebound from relapse she dedicated herself once again to her passion in theatre where she was able to hide her self-destructive eating habits from the world and function well for another 10 years. When her father is killed suddenly in a car accident, her tenuous balancing act between anorexia and theatre falls apart, she plunges down to a low weight and the trauma and stress force her to retire from her passion. Her love for animals, which starts with her beloved dog Gus, leads her to a second career at the Los Angeles Zoo and Botanical Gardens, where she learns to nurture others, as well as herself. In order to stay alive she explores many philosophies of recovery. In recent years she came to understand that being of service to others provided the most comfort and freedom from anorexia. Unfortunately, due to malnutrition she grows too weak to help anyone. She has to admit that if she is not taking care of herself, there was no way she can be of service to others. This is the genesis of "The Oxygen Mask Rule." Onboard an airplane, passengers are instructed to make sure their masks are on first before assisting other passengers. She learns to apply this rule to her own life and embraces it as the golden rule in her recovery from anorexia nervosa. Although she says there is no proven cure for anorexia nervosa, Thompson believes that people suffering and gasping for air from their eating disorders can find comfort and hope from books by individuals who have struggled with the same affliction.